Your child deserves a nice chair for in your home and now there is a nicely upholstered Batman kids chair that would be perfect for in your home. The chair is black and looks like a leather chair making it look really nice in your nice living room. The back of the seat shows the famous Batman symbol and below it you can see the muscles just like in Batman’s costume. Below the seat the Batman chair shows the famous tool belt Batman wears and it is yellow just like the real one. 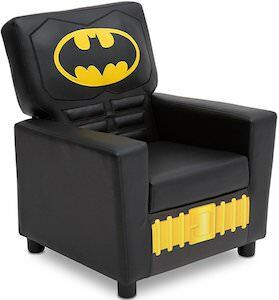 I am sure that your child is going to love sitting in this Batman chair and watch TV or read a comic book.